Not all the schools on the estate were numbered. The Catholic school on the estate, located in Montacute Road, was called The Holy Family School and provided a mixed infant, junior and senior education. Being a faith school, its catchment area was wide ranging, including Sutton, Mitcham, Cheam, Worcester Park and many other places. In some instances it provided a secondary school facility for schools elsewhere that only provided a primary education. This total provision was in due course modified. Unlike many local schools, it was without a games field. At one time it used the private field belonging to Hill House. This was in Middleton Road and ran from Bishopsford Road traffic lights, where the gated road to Hill House was, towards Robertsbridge Road. This ground was eventually built on to provide extra housing causing the school to use Moreton Green on the corner of Malmesbury Road and Middleton Road. The school eventually acquired the ground adjacent to the church and on the corner of Lillleshall Road and Bishopsford Road which gave it a permanent facility which is still there today. For many years this piece of ground had been unfenced and considered by most local people as a piece of waste but was obviously owned by someone. During the war years some, if not all, schools had air raid shelters on the school's grounds. In The Holy Family School there were several that ran at right angles to, and were just over the back garden fence, of the houses in Bishopsford Road. Apart from a shelter, the parallel long humps that these shelters provided with their roofs was a much used and appreciated diversionary play ground. Another point is that some infant and junior teachers were nuns from the convent in Pollards Road, which is off Bishopsford Road on the hill towards Mitcham. I wonder if that is still there. This page was added by Cheryl Bailey on 26/09/2010. I attended The Holy Family and we always knew it as No 5. I feel sorry for you if you were one of the boys at the receiving end of sister Benignus's cane at morning assembly ! I went to the Holy Family school from about 1944, having been bombed out of Bethnal Green, until 1953. I well remember sister Benignus or sister'' big knickers ''as we used to call her. She had a lightning draw with her cane and seemed to delight in using it. I went right through the school, from Mrs Martinetti, a lovely woman, the nuns in the '' Juniors'' and into the secondary school. Most of the teachers in the secondary school were fine, Mr Flynn, Harry Holden, Mr Kipplin, Miss McCabe among others . Some nowdays would be liable to prosecution for physical abuse. All water under the bridge now but never forgotten. I remember being in the nursery with Mrs Martinetti and then of course we went through every class until we left the school about ten years later! The giveaway with Sister Benignus was her bunch of keys that hung from her waist. You could hear her approaching so we were able to find a hiding place. Mr Mann was the Head I recall....he was a kind man and I do believe that he had a nervous breakdown...there was one occasion when a small riot took place and many school windows were smashed. I too went through the school from Mrs Martinetti in 1944 to finish with Mr Cummins in 1957. I remember Sister Benignus in the juniors and Mr Yeardsley in the seniors....both heads who would cane at the drop of a hat! Why were the girls called by their first name and boys by their surname by the teachers? I recall a boy broke into the local ATC in 1956 and stole boxes of live bullets! It seemed as if every boy had bullets in his pocket. Does anyone remember Miss O'Driscoll she was like Cruella Deville, she caned me all the time. The best teachers were Sisters AnnMarie and Anthony , Mrs Gately who taught my children, Miss Martinetti was lovely coming from Bermondsay to teach us. I have to agree with Ray Crawley the Holy family Catholic School was known as number 5. I to went from the infants to Juniors then seniors the infants, Miss Martinetii was lovely, Sister Benignus's the head was horrible, I can still hear her saying (peek up that peece of paper) making you kiss her crucifix as you came in and think nothing of caning 5 yr olds a sadist, Sister Theresa was another, if you were a bit slow she would drag you out of your desk by your ear, it was a wonder some of us didn't look like Dumbo. Cant remember if Sister Anthony was infants or Juniors, she was alright as long as you didn't upset her then it was the cane only she always used the black board pointer and would bring it back up under you knuckles, Juniors. Mrs Gately another lovely woman. I agree Sister Ann Marie, was a saint, she made me fight back when I was being bullied solved that problem. Into the seniors Mr Swallow took us for Science and music another good teacher he left to go into the Navy , All of the teachers had no problem using the cane, though some had no need too, Mr Flynn was one that rarely used it, Mr Holden wood work teacher, favourite expression! luke at the buke a liverpudlian. Mr Norton Phys Ed Favorite punishment a number nine slipper, though would use the cane in the classroom. Miss Bray really old school teacher , only remember her teaching us music after Mr Swallow left . Mr Mann was the head and wasn't a bad bloke, though he did fracture a kids skull, The kids dad gave him a good hiding, A couple of years later he was having a nervous breakdown, he couldn't control the boys, most thought it was an ideal time to play up and make his life impossible not realising what was really going on, Ray you would remember that. Ref the comment about a Riot, what happened was that Mr Mann had gone, Miss Bray was acting head, they were having a meeting ,so all the kids were in the playground except those of us who had gone home for dinner. The meeting ran over and it started to rain, the kids wanted in, any of my generation will remember, the playground was a mess all broken half of it was just stones, someone picked up a stone and threw it, then dozens followed suit, result when they got us in every one had to write a thousand lines about I mustn't throw stones, Harry Holden was the guy that gave me mine I told him I didn't throw any stones, I only came back at the tail end of it, he said I had to write them anyway, which I did, when I gave them back to him, he said I thought you didn't throw any stones, I said I didn't, he said, Then why did you just write that you did that's a confession or words to that effect, he was very sarcastic. I then tore them up and he gave me the cane, I never forgave him for that, not for the cane but for the injustice. Then came Mr O'Reilly as Head master, The Man was a sadist, he instituted a system called stars and stripes, on big boards posted in the hall way, if you did something good you got a quarter of a star, when you got a whole one it went on the board, whereas if you committed a major crime like talking, being late, or anything else a teacher considered was going to cause the fall of the Pope, you got a whole star and a caning from Mr O Reilly who never gave less than six, he also brought in Mr Carol and Mr Magnusson, both who dished out stripes like they were a reward, the injustice of the system was so obvious that some of the boys started to compete to see who could get the most stripes, as being slower or not so academically blessed, they got stripes right left and centre without really trying. ‘Mr O Reilly never asked “your side of the story, if you had a problem, I never heard of him ever giving a word of encouragement, I do believe he actually enjoyed the power his position gave him to punish young boys. My Brother Ray and I were evacuated to Barnsley, Yorkshire during the war,,I remember Sister Anthony and Sister Anne Marie, coming to visit us,The Holy Family children were all living fairly near each other, They would take us for walks,,through lovely parks.. Anyone remember the cookery teacher Mrs O'Sullivan at the huts? I heard that she suddenly left and it seems she was admitted to a mental hospital, not at all suprised.Or Father Dodd poor man who was tortured in a prison camp during the war. Mr Carol is the teacher in the above photo of the class of children I provided above many years back now and Pat Heard should recognise herself in the photo also. The teacher after Deans was Driscol. The teacher, Kipplin, was once a pupil at the school and in my day the science teacher was a very nice man with the unique quality, for that school, of exhibiting a total lack of sadistic tendencies. His name was pronounced Fo-vay A very short man with glasses and a possibly German tinged accent. Mr Magnusson was the woodwork teacher who was very popular until he went on a course and on his return was as sadistic and miserable as the rest and then as detested as the rest. Perhaps that's what it was. they all had to go on this course of sadistic tutition, all passed with distinction and that's their common denominator. Another institutionalised bigot was the biology teacher. a certain Miss Haye , who blew a gasket and caned me for pointing out in a test paper the similarities between humans and other apes. This, to a totally obsessed religous fanatic. was confirmation I was in need of a dose of thrashing to save me from eternal damnation. Being very kind she did her duty and tried her hardest with the stick to save me from this terrible fate and probably went home feeling very saintly as a result. What a lot of these teachers didn't appreciate was their obvious joy in caning the children did nothing more than make the children despise them and it was this despising that caused the children to rebel and play up. There was no way any child was going to lose face with the others by being intimidated by this caning so would demonstrate this by playing up again. 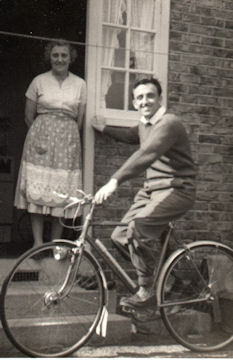 Was born 1945 in St Helier's Hospital and lived at 13 Selby Green until I married in 1966. 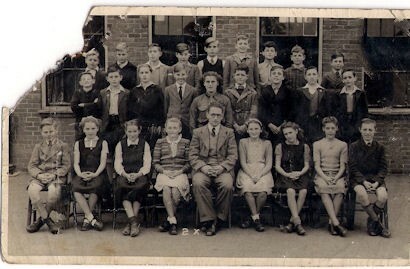 Went to Holy Family School 1950-58,then Malmesbury Rd Girls School. Like many others who went to Holy Family it was a terrifying experience because of the nuns. I used to wait in the hall after school for my sister Mary to come back from the huts whenever she had a class there and remember one day a friend of hers came back before her. She swung me around by my arms and Sister Benignus came in and slapped (or caned?) my legs so hard. All I remember was the pain and her fierce face...plus the indignity of it all. I don't remember her saying anything to the bigger girl, but am sure she did. I went home and told my mum who then went to Sister Benignus and read her the riot act. After that it was as if the woman became even more spiteful towards me. They were vicious and the only two who were kind to me were Sister Teresa and Sister Anne-Marie. I got what I believed to be a drum stick beating on my hand by Sister Antony. It was not a cane and was very painful. I was talkative and she was the teacher so she had to discipline me but both of those ladies resorting to violence which horrified me. Senior School was a more positive experience and I liked all the teachers. My sister's time there was totally different. She loved every minute of her school days and is always telling people how fortunate we were to go there. Growing up on the Estate was good and we kids had a fantastic time. 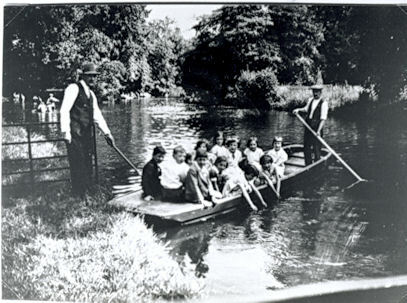 I live opposite Poulter Park so spent a lot of time there or paddling/catching tiddlers in the River Wandle. My dad liked the football which I used to watch with him and then in the summer we went to the other part of the park to watch the cricket. He had an allotment there as well near the Watermeads. 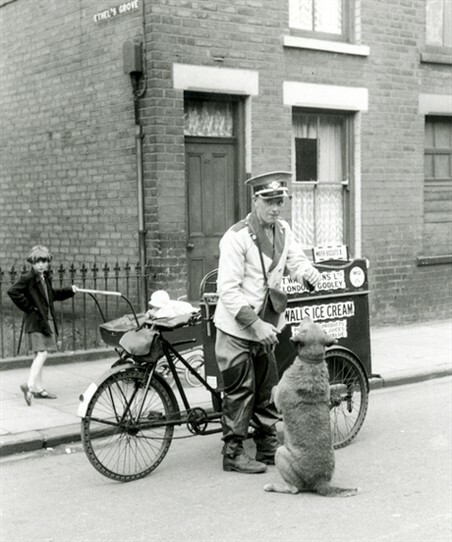 I remember Price's bread being delivered by horse and cart and both he and the United Dairies milkman we had always seemed to be whistling. Happy days!!! Having failed my 11+ I went to Holy Family from 1955 to 1957. Mr Yeardsley was the head with Mr Cummings his deputy. I particularly remember Miss McCabe, who I recall as being a fair but strict teacher of Maths & English. Having read the previous posts, one thing that puzzles me is that I can't remember the presence of any Nuns. I remember the huts where Mr Holden taught Woodwork and Mr Williams was the science teacher. As one of the previous contributors said Harry Holden had a nice line in sarcasm. I can remember receiving the cane (a carefully selected piece of Dowel rod) and him saying "And there shall be weeping and gnashing of National Health teeth." One older pupil I remember was Mick Fallon, who used to swagger round in a Black Bomber jacket looking, for all the world, like a 50's version of The Fonze. I met Mick a few years later when he was working as a Hairdresser for Joe Palmer, in Morden. He was a really nice guy. One of the boys from my year, Mick Rooney, has gone on to become an accomplished artist. Must have been down to Mr Pochetti, the art teacher? Failed 11+ St.Joseph's Epsom. Remember most of the teachers mentioned. Ex RAF Mr. Williams was English teacher. Very fair and respected. Had a few painfull experiences with Mr. Cummings cane. Polish teacher teaching French. (Mr.Messerschmidt? ).Remember walking to and from the huts. Williams,Holden and Mr. Jones metalwork. Hard to determine if whether or not it was a good school. Maybe I was a poor pupil. I was fourteen on my last day of school;fifteen in the holidays. Got a job,never went back. Must visit the old school one day. I attended Holy Family 1961-1966, a very poor institution (though probably very poorly funded). I recall walking between the three sites, each located a great distance apart, to get to the next lesson. Young boys walking the streets unsupervised. Good/excellent teachers excelled given such poor resources, Miss McCabe (mentioned earlier) and Mr Scott. To them both I'm very grateful. There were other good teachers too, but a few were hideous e.g. Mr Martin, an absolute thug, who I'm sure would be behind bars if he behaved today as he did then. Unfortunately I jest not. PS I recall the Polish teacher with fondness, he was a lovely kind human being who must have witnessed terrible things during his life. I attended Holy Family seniors 1953-1957. There were no nuns teaching at that time. I remember Mr Yeardsly, Miss McCabe, Mr Flynn (he was my favourite). I will never forget Mrs O'Sullivan who taught domestic science at the huts. She was an absolute witch who instilled terror at every lesson. The school is now St Theresa's and I recently went back and had a look round. The hall where we had morning assembly was just the same and I felt 11 years old again. I also remember a large Irish teacher who taught maths, I think he was Mr O'Connor. He used to hurl the blackboard duster at anyone that annoyed him. Thank goodness times have changed.